A glass bell in the kitchen. ABSOLUTELY GLORIOUSO!! THE COLORS, THE VARIETY OF COLORS, SHAPE … I AM IN LOVE WITH THIS!!!!!! Your use of color and reflections is just spectacular! Love them both. You have such a unique and wonderful way with colour Ronell. Fabulous! I love your style, such great loose strokes and colour! Oh wow! I love the colors in your paintings! It’s a freedom in painting that I really envy. Thanks for sharing and for giving me something to aspire to. the one in the garden does it for me! Beautiful! 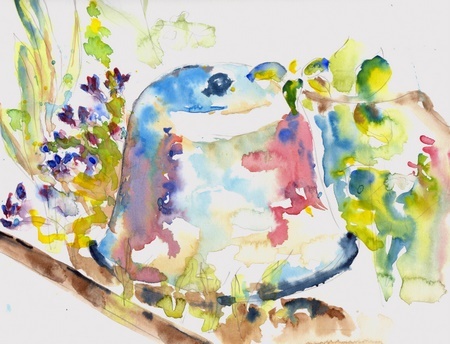 Beautiful bells – such gorgeous loose drippy color. and those cantelope are the epitome of summer. Thanks for all your comments…it is inspiring and it encourages me to continue, experiment AND enjoy it! These are stunning. The colours are wonderful. Oh WOW Ronell these are simply STUNNING!!!!! Beautiful transparency, colour and style, Ronell. I can’t choose between them. Yummmy colors …these are wonderful…. 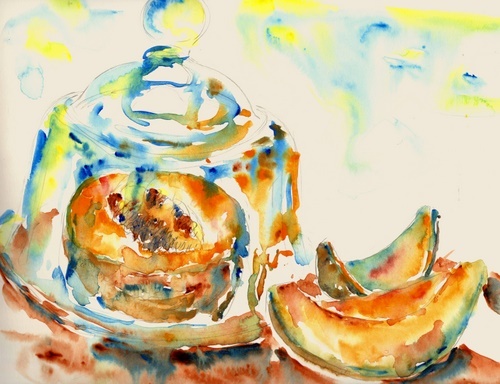 I really enjoy you watercolors, they are so animated even in your still lifes. GORGEOUS, Ronell! I love the idea, and the colourful execution of it. Just gorgeous! Those loose washes that you do so well really being out the sparkle of the glass. Very well done.